The name Star of Indiana evokes an image of legend in the minds of many drum corps fans today. 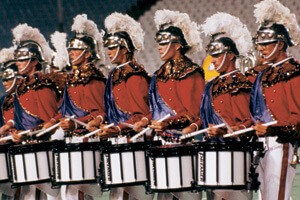 This corps, who took the field from 1985-1993, accomplished much in its relatively short existence, making the World Championship Finals in its very first year and winning a Championship in 1991. With groundbreaking programming that many considered ahead of its time, Star of Indiana is a major influence on the drum corps activity as we know it today. 2010 marks the 25th anniversary of the Star of Indiana organization. With the return of the DCI World Championships to Indianapolis, alumni decided to take matters into their own hands and form the Star Alumni, which will perform during World Championship Semifinals, Friday Aug. 13 at Lucas Oil Stadium. "We have a full field production, so it's going to be more than the corps moving and playing music," said Star Alumni Project Manager Amber Sears. "There's an audio-visual portion, we have props, it's a full scale production. And we will be playing excerpts from all of the corps' competitive years, from 1985 all the way through 1993." To help fill the ranks of the corps, Sears said Star Alumni draws from members from the original Star of Indiana drum corps, as well as other Star performing groups like Brass Theater, Blast! and ShockWave. They've also included what Sears calls "second-generation alumni" who were taught by former Star brass caption head Donnie VanDoren.